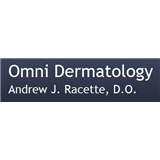 Omni Dermatology, Inc. (Glendale) - Book Appointment Online! Dr. Racette was named a "TOP DOC" 2010 for dermatology in Phoenix Magazine. He is a board certified dermatologist. We offer same day or same week appointments. We are open 5 days per week and stay open over the lunch hour. In addition we are open on Friday from 8 AM - 5 PM and see patients until 3 PM! We offer the latest techniques and use the newest technology for detection and treatment of skin cancers. We are regularly involved in research with pharmaceutical companies for the benefit of our patients. ***Please note if you have any AHCCCS or a certain HMO plan make sure you have a referral or authorization that is needed in order to schedule an appointment with us, if you have any questions please call our office to schedule*** Thank you! Dr. Racette was very reassuring. I'd come in with concerns about spots that my Doctor told me to have a look at and it was great to have a fast diagnosis, on the spot treatment, and an assurance that it wasn't anything to worry about.